Rising sea levels are causing more frequent flooding in some U.S. coastal communities from Florida to New York. The surge is hurting home sales, sparking soaring insurance rates, and spawning an industry aimed at limiting damage and costs. In the Norfolk, Virginia, area, the nearby ocean, bay and rivers brought centuries of prosperity from maritime activities, including a major commercial port, the world’s largest naval base, a fishing fleet, and many businesses that support ocean commerce. Having the Atlantic Ocean for a close neighbor has a cost as rising seas encroach on many low-lying neighborhoods. Three floods have hit Karen Speights’ Norfolk home in the past few years. Her home was built in 1921 and is about 100 meters from one of the area’s many waterfronts. Speights’ house had been dry for decades until she had a nasty surprise the first time floodwaters rose inside her home. Old Dominion University researcher and retired U.S. Navy Captain Ray Toll says seas have been rising for quite a while. In an interview, he holds up a smartphone and says seas have been rising about the length of the phone every 20 years over the past century. He is concerned that the rate may become faster. Flooding waters of theTar River cover the Riverwalk Apartments due to rainfall caused from Hurricane Matthew in Greenville, North Carolina, Oct. 11, 2016. Toll says higher sea levels make homes, businesses, and the huge naval base more vulnerable to flooding, particularly when high winds combine with high tides. “You better be ready for flooding from all directions,” he said. Scientists say part of the problem is that the land in the Norfolk area is subsiding because of the complex effects of an ancient meteor strike and glaciers; but, researchers say most of the problem is because of rising seas. 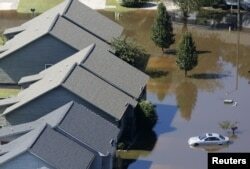 Real estate data expert Daren Blomquist of ATTOM Data Solutions says worries about flooding are beginning to affect demand for homes in coastal areas around the nation. Traditionally, pleasant climate and nice views meant coastal homes commanded top prices, he said, but some buyers are having second thoughts about major investments in vulnerable areas. Blomquist says the only surprise is that home purchasers have reacted so slowly to the growing threat. Meantime, coastal residents and businesses are seeking ways to protect their properties and cut the high and fast-rising cost of flood insurance. Some owners go to the trouble and expense of raising their entire home above the predicted level of floodwaters. The effort is complicated and expensive, but can make economic sense if property becomes less vulnerable to flood damage and insurance companies charge lower rates. A lower insurance cost also makes it easier to sell the property. Raising buildings is not always appropriate or practical, according to Mike Vernon, a flood mitigation consultant at Flood Mitigation Hampton Roads. In an interview in the basement of a century-old apartment building, he says that in this case, he will move vulnerable utilities and appliances to higher floors. Vernon also plans to put special flood vents in the walls of the building’s lowest floor, and cut drainage outlets in the concrete floor. His crew will then fill the space with sand. The idea is to allow water to enter and leave the building without harming it. Vernon says the mitigation industry is in its infancy, but it is developing many new techniques and growing fast. Both Vernon and Toll say homeowners, military leaders, city officials and scientists are beginning to work together to improve the science and engineering behind mitigation efforts and to clear away the thicket of sometimes conflicting rules, laws and customs that currently hamper efforts to cope with rising seas.